As North Korea continues to reel from an unprecedented heat wave, the authorities are conducting a nationwide assessment of the damage that has been inflicted on crops as well as on-site farm visits, report sources in the country. The source said that the authorities have sent investigative teams to farms throughout the country who are taking photos of the damage and sending them back to central headquarters. The roots of the corn crops have yellowed because they have dried out from the lack of rain. North Koreans consider the agricultural season to be “finished” this year. Farmers have suffered from both the double impact of intense heat and drought. In Musan County, where mining activities have stopped, many miners have sought to obtain land after facing significant difficulties. The intense drought has created concerns about how they will feed their families. “There are many people saying that the ‘weather is killing us’ while beating their fists against their chest in front of their dying crops,” said a source in Ryanggang Province. Officials who are part of the investigation teams, however, are reportedly saying that there is no hope in recovering from this year’s agriculture troubles. “Officials have dwindling hope about this year’s harvest, and some even say the only thing to do is wait for the intense heat to end,” the Ryanggang-based source added. Meanwhile, the state-run publication Rodong Sinmun has reported, “Farmers are taking it upon themselves to conduct a powerful campaign to prevent damage [to the crops] from high temperatures and drought.” The state authorities are emphasizing “self-sufficiency” as a tool to combat damage to crops, which also hints that the authorities have little in the way of clear cut measures to deal with the situation. North Korea imported the largest-ever amount of rice from China on a monthly basis in September since the launch of the Kim Jong-un regime in 2011, in an apparent bid to stabilize prices, a U.S. broadcaster, monitored here, reported Thursday. North Korea imported 18,477 tons of rice and other grains in September, the Voice of America said, citing an analysis of data from China’s General Administration of Customs by Kwon Tae-jin, director of East Asia research at GS&J Institute in South Korea. The September figure was about 2.7 times higher than 6,954 tons imported in October and about six times higher than 3,158 tons imported a year ago in September, the broadcaster said. In particular, the North purchased 16,000 tons of rice from China in September, a monthly high since the start of the Kim Jong-un regime, and higher than the 14,000 tons imported during the first eight months of this year total, the broadcaster said. Experts opined that the step is designed to stabilize rice prices at a time when the stock has hit its bottom, the broadcaster said. “This is the time when the harvest is around the corner, and the stock is nearly exhausted,” Kwon said. N. Korea imports rice on large scale in Sept. Discussions such as these are always complicated by the fact that for most regions, private market supply is probably far more important than whatever the PDS supplies. 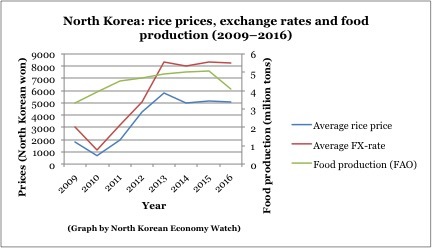 Food prices in North Korea’s northeastern region, which has been hit by devastating floods, have doubled due to the slow pace of recovery and poor distribution networks, U.S.-based media Radio Free Asia (RFA) reported Thursday. Citing a report by Japanese media outlet Asia Press, the RFA said the country’s northern cities of Hoeryong and Namyang are experiencing a spike in rice and corn prices which soared to 8,000 won (US$7.24) and 2,000 won per kilogram, respectively, from 4,300 won and 1,000 won before the worst-ever floods in decades. The flooding caused severe property damage with many people being reported dead or missing. The Japanese media said there is a likelihood that other commodity prices will likely soar following rice. Jiro Ishimaru, who heads the Osaka office of Japan’s Asia Press, told the RFA that rice prices rose rapidly as the transportation situation in the flood-damaged area is very serious, with the railroads and overland routes being almost blocked. The official said the lack of transportation means is leading to poor distribution of food and commodities. Ishimaru, in addition, warned that water shortage and sanitary problems will also follow due to a shortage of personnel equipment needed to speed up recovery. 북한 당국이 ‘60년 만의 대재앙’ 수해 피해를 입은 함경북도 지역의 물가 안정을 위해 총력을 기울이고 있는 것으로 전해졌다. 인민보안성(경찰) 인력을 동원해 쌀 사재기와 가격 인상을 통제하면서 내부 안정화를 꾀하고 있다고 소식통이 알려왔다. 함경북도 소식통은 27일 데일리NK와의 통화에서 “현재 쌀 가격 등이 큰물 피해 이전과 거의 차이가 없다”면서 “보안원과 순찰대가 출동해서 쌀 사재기 및 가격을 올리는 행위 등을 강력하게 막았다”고 전했다. 소식통은 이어 “(수해가 일어나고 얼마 되지 않아) 어떤 장사꾼은 1킬로(kg)에 5000원, 5300원하던 쌀을 8000원에 팔려고 하기도 했다”면서 “하지만 보안원들의 통제 때문에 눈치만 보다가 그렇게 하지 못했다”고 설명했다. 그러면서 소식통은 “회령시의 경우 한때는 쌀 가격이 6000원까지 폭등하기는 했으나 지금은 5000원 대로 하락했다”면서 “돼지고기 가격도 1kg에 13000원 등 원래 가격과 같다. 물가가 전반적으로 차분하다(안정돼 있다)”고 덧붙였다. North Korea is going all out in blocking the cornering and the skyrocketing of rice prices in its flood-devastated northeastern areas, a Seoul-based news outlet specializing in the North reported Wednesday. This summer, six areas in North Hamkyong Province in the North were devastated by heavy rains accompanied by Typhoon Lionrock, with the United Nations having estimated that 138 North Koreans were killed and 400 others are missing by the floods, with about 20,000 houses destroyed. “Security agents and patrolmen are strongly cracking down on activities of cornering rice and raising rice prices (in flooded areas),” the Daily NK quoted a source from the North’s North Hamkyong Province as saying. Therefore, there’s no big difference in rice price before and after the worst-ever flood hit the region, the source said. “A merchant was trying to sell 1 kilogram of rice at 8,000 won shortly after heavy rains flooded the area, but was unable to do so due to strict control by security agents,” the source said. 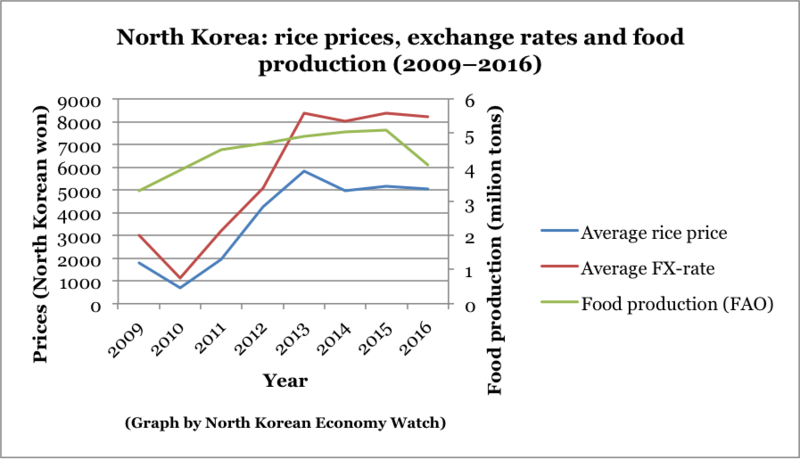 Rice price once soared to 6,000 won from 5,000 won per kilogram before the floods, and now remains at the 5,000 won level, according to the source, adding that pork prices also showed no noticeable change, selling at 13,000 won per kilogram as before. “Prices in the deluged areas are stable, in general,” the source said. Several things are worth noting here. 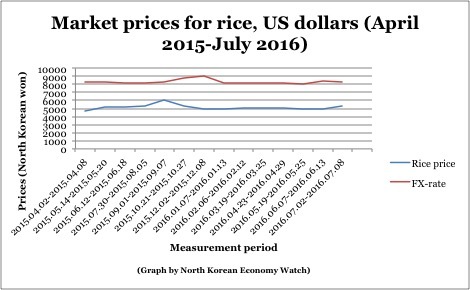 First, historically, it is common for food prices to rise as a result of seasonal flooding in North Korea. After the severe floods in 2012, rice prices shot up from 4866 won/kg in July to 6533 won/kg in late September. Second, the rise in prices reported by RFA/Asia Press might have been a temporary shock. The DailyNK price graph, last updated in early September, shows very moderate increases in prices after the floods hit in late August. Perhaps prices stabilized quickly as supply did (i.e., deliveries coming in from other areas; this is only speculative though). Third, price controls are difficult to maintain under pressure. Had there been a massive pressure for prices to go up due to drastically decreased supply, it is hard to see that the government would have been able to effectively keep market prices at a certain level across the board. I will try to keep this post continuously updated as market price information gets updated. There has been much interest in Kyodo’s (a Japanese wire service) reports on the atmosphere in Pyongyang following the imposition of sanctions on North Korea back in March by the UN Security Council. According to Kyodo’s ‘current report’ on the subject from August 21, ‘200 Day Speed Battles’ and ‘Mallima Speed Creation’ slogans can be seen in many of Pyongyang’s streets. While surprisingly Pyongyang appears unchanged following UN sanctions, the entire nation is subject to a general labor mobilization. The 200 day speed battle began in June and aims to raise food production. Mallima Speed Creation is a slogan created to inspire workers to engage in productive activities at the same speed as a horse that can cover 10,000 li (around 3,927 km) in a day. The Mirae Shop, a department store refurbished and reopened in April, has a tidy display of imported cosmetics and electrical appliances, but is largely devoid of visitors. A member of staff explained that “because people are busy with the 200 day speed battle, there are not many customers.” The Kyodo report thus argues that the effect of sanctions on Pyongyang is as yet limited. Regarding the supply of and demand for electricity, he stated that “while we cannot fully satisfy demand, the development and introduction of coal additives in coal-fired power stations has dramatically increased production. . . . Many hydroelectric power stations making use of rich hydropower resources have been constructed.” Hence it can be inferred that while electricity supplies remain insufficient, they continue to increase. 기자) 코슬렛 담당관님, 우선 북한 식량 사정에 대해 살펴보죠. 요즘 북한의 식량 사정 어떻게 평가하고 있습니까? 기자) 북한 당국의 식량 배급량을 통해서도 북한의 식량 사정을 가늠할 수 있지 않나요? Of course, given the way that the North Korean economy functions today, one might question how much PDS-distributions really matter. There is quite a bit of regional variation in dependency on the PDS, and whatever the actual state of food supply, different localities will be hit differently whenever food supply is lacking.